At a meeting of the Northants Education Committee on Saturday the following is presented by the General Purposes Sub-Comimttee:- "The Sub-Committee considered the petition from property owners and householders of Little Irchester in favour of the provision there of a Council School to accommodate the whole of the school population. The Secretary stated that the question of school accommodation at Irchester proper was not yet settled: the infants were still attending a temporary Council School, and negotiations were proceeding for the conversion of the old Church School into an infants' Council School. A decision on the petition was postponed with a view to the question raised being dealt with in conjunction with the provision at Irchester of permanent school accommodation for infants. "The County Committee concurred. 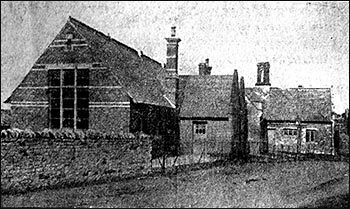 Our photograph is of the schools at Irchester, which have recently been the subject of considerable controversy in the village, upon which an interesting enquiry was held on Thursday week. They are known as the old Church of England Schools. The question is whether a new infants' school should be built on the site near the girls' school, or whether the old schools we reproduce should be adapted to the modern requirements. The County Council, having heard the views of both sides, have now the matter under consideration. A meeting of the Irchester, School Managers was held on Monday last, when there were present: Mr. J. A. Kemshead (chairman), Mrs. W. A. James, Messrs L. Parsons, T. C. Hartwell, E. A. Taylor, and the clerk (Mr. F. Partridge). The Managers received with great regret the resignation, owing to illness, of Mrs. Gray, who had been head mistress of the Infant School for upwards of 33 years. The Chairman said Mrs Gray, by her ability and sympathetic training of the children placed under her charge, had gained the respect of all.A resolution was passed conveying the good wishes of the School Managers to Mrs. Gray, and their hope that she might speedily recover from the serious operation which she has recently undergone. Miss B. Smith, assistant teacher of the Mixed Department, gave notice of her intention to resign owing to her approaching marriage. It was resolved, on the proposition of Mrs. James, that the School Managers present a book to Florrie Brown as a mark or their appreciation of her completing six years perfect attendance at school.